„A human body starts to decompose four minutes after death. Once the encapsulation of life, it now undergoes its final metamorphosis. It begins to digest itself. Cells dissolve from the inside out. Tissue turns to liquid, then to gas. No longer animate, the body becomes an immovable feast for other organisms. Bacteria first, then insects. Flies. Eggs are laid, then hatch. The larvae feed on the nutrient-rich broth, and then migrate. They leave the body in orderly fashion, following each other in a neat procession that always heads south. South-east or south-west sometimes, but never north. No-one knows why. In the beginning there is a corpse or more than one – or whatever is left. Then there is the police and the medical examiner, the pathologist, the coroner… and maybe there is the need of another specialist in case the corpse is dead for a rather long time, decayed, degenerated, decomposed, burnt, rotten – I think you get it. Then a forensic anthropologist is called in. It’s Dr. David Hunter’s job to examine all these remains. He is called in as an external advisor, a police consultant, independent from police and prosecution. In his – let’s say – real life he works at an university and mainly deals with archeological finds. I, Marlowe, think I should mention that there are detailed unpleasant accounts about the corpses, their examination, the ghastly parts of the autopsies etc. Of course, it depends what you consider for yourself „unpleasant“! Today it’s more and more on the agenda of crime literature to deal intensively with any disgusting details, however, in the series about Dr. Hunter it seems to be restricted to the bare necessities – no additional artificial needless thrills. All is reported more in style of a scientific account than a thriller. Nevertheless the novels are nerve-wrackingly fascinating. We follow Dr. Hunter (I always call him like that because at the beginning of one the novels he’s a little annoyed when a police officer ignores his doctor’s degree) over at least about 9-10 years. Chronologically his story starts with the tragic accident of his wife and his daughter while Dr. Hunter is working at a case. This accident and the „unfinished“ case, however, are only part of a later novel starting with a look back because of a recent incident. The series starts with Dr. Hunter having abandoned his specific field of forensic anthropology to work as a GP in the English countryside. He seeks a new beginning after the tragic accident of his wife and daughter. However, about three years later he gets involved in a murder series just in the village where he lives. From being a suspect he quickly becomes the scientist analyzing the corpses – and afterwards he accepts his old resp. new role and restarts in his real profession again. The main subject of the series are serial killers and their collateral damage – at least three of the novels deal with this specific species. 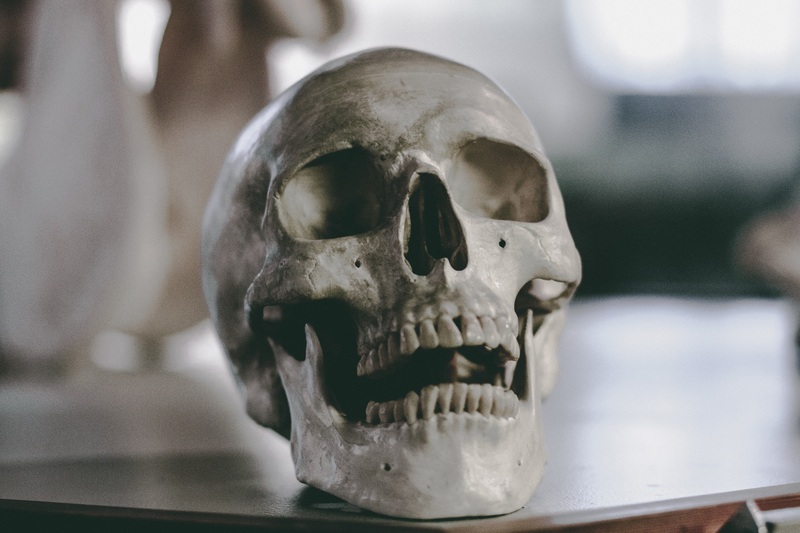 In general the corpses always pile up according to the scheme: the first murder leads to the next… to the next… While these events – sometimes – last for some time the corpses – or better the remains – are in decay. Well: if there is a road accident and the victim ends up in a hospital and dies there is no need to call in a specialist like Dr. Hunter. He is always requested when a victim is found after weeks or months or years in humid soil, is washed up at the beach after days, burnt to ashes, mummified in an airless attic… This means that you will get to know quite a lot about the state of a corpse and the chemical processes that led to its current shape. Here it starts to get nasty – if your imagination and your nerves start spinning. This is only one element of the series. Until now you might be misled to think that the novels mainly report what happens where the corpses are found or during the autopsies, however, Dr. Hunter is an active member of the investigation team well-known for pursuing his own way. He likes to care about the whole case and cannot be limited to his very own tasks. Secondly, Dr. Hunter’s stubbornness delivers action and thrills. He likes to follow his own ideas and often gets into trouble – physical trouble. If he wasn’t so fit and able… At this point I noticed that Dr. Hunter isn’t very careful – he likes to walk into traps and has to struggle for his life to survive. This part of the results make all the novels extremely fascinating. While always escaping, whenever sometimes a narrow escape, Dr. Hunter isn’t as happy and successful when it’s about women in his life. Concerning women in general he seems a little green. He is a gentleman, but he is taken in by more than one woman in his life. He is lonely and would like to have a woman at his side, but always he seems to fall for the wrong woman which brings us back to his thrilling adventures beyond the morgue and his laboratory. Did I like to read about the adventures of Dr. Hunter? Yes – I did especially the matter-of-fact style concerning the corpses. This is a trademark of the novels. There is a novel about a really bad serial killer… I think this is somewhat overdone. (Even stubborn US policemen cannot be so blind and deaf that they don’t get it when dozens of people vanish… even though over some years!) There is also a case where the killer turns out to be a police officer – oh well! There is always a slightly depressive undertone in the novels coming from Dr. Hunter who is still mourning his wife and daughter – maybe he finally moves on. …and there is always the haunting question about this woman who tried to kill Dr. Hunter – of course he survived, but the woman is still on the run. Maybe she’ll try to finish her revenge with another longer and sharper knife. The next novel is on its way.